Preheat a panini press (or a George Forman Grill or a pan w/ a press). Drizzle a bit of olive oil on both sides of both slices of bread. Grill the bread slices until they begin to turn golden, ~1-2 minutes. 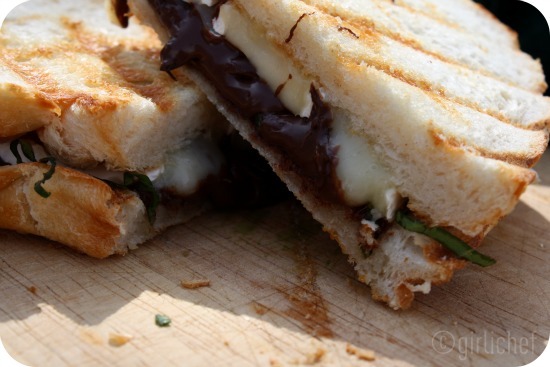 Remove from the grill and place cheese on one slice of bread, top the cheese with chocolate chips and then add basil. Top with the other slice of bread. Return sandwiches to the grill/press until the chocolate begins to melt, ~2 more minutes. So, which list do you think this panini made it onto? Actually, the "good" list. I would, however, cut back a bit on the suggested amount of chocolate...and add to the amount of cheese (which are reflected in the lower and higher amounts in the ingredients I listed, respectively). I may not make it all that often, but I have a feeling a craving could creep up on me from time to time. So, I'm happy that I finally tried this sandwich and I wish Giada a fond farewell! And since this was our very last week...our very last day, actually...to cook with Giada over at IHCC... We're all set to get naked and join the revolution (starting tomorrow) with Jamie Oliver for the next six months. I hope you'll join us! Well, this is a combination that I never would have dreamed up, but why not? It looks delicious! I'm sure that was an interesting combination indeed...I'd love to give it a try. I haven't tried brie since I was a teenager and declared that I hated it, I need to give it another go! Very interesting sandwich. Who would have thunk it?! Oh gee...this is a most wonderful combination. I have a feeling this is going to become one of favorites. You just made my Sunday! Your photos always look so yummy!!! THIS IS WAY PAST SINFUL!..omg,looks divine. A chocolate sandwich! This did get my attention and I am not surprised it was good - it works well paired with the brie. A sinful, delicious looking treat? Lunch? I've never had a chocolate sandwich before, now I have to think about it lol :). It looks so delicious! Hard to believe you cut back on the chocolate considering all the gooey, oozy chocolate taunting me from your pictures! You are the one who introduced me and my family to the cheddar scallion ciabatta. I have made it so many times, I've lost track. 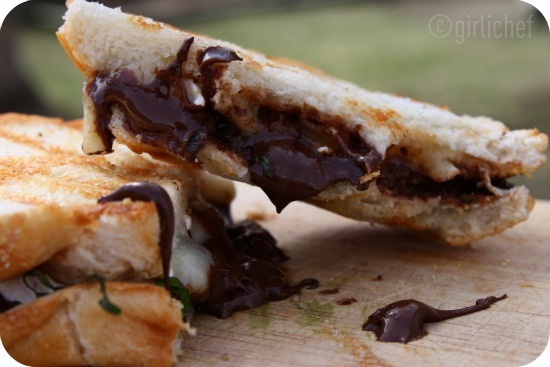 Oozy, gooey panini. Cheesy, oniony bread. You are one brave girl! I can see the chocolate and cheese. But the basil really through me for a loop. Basil? interesting. LOL. I just might join you all for this next round with Jamie. i've been eying some of his books but can't choose which one to buy. What an unusual combination but looks delicious! Fabulous photos too:) I loved Giada's Everyday Italian series but am not digging Giada at Home as much. It seems every dish has to be approved by her 3 year old for some reason - lol! Thanks for sharing & looking forward to Jamie Oliver - Cheers! You and Giada did have quite the tumultuous relationship, but what a way to go out with a bang! I might have to try this with nutella instead of chocolate. Moan. am drooling over the pics Heather !! they loook GORGEOUS! Love the drippy shot. I'd definitely give these a try. I think this combination sounds fabulous. 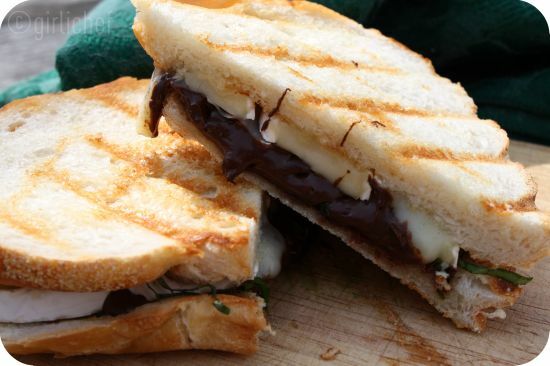 I just love the idea of Brie and chocolate together and the addition of basil is brilliant. I love when there is an unexpected surprise to a recipe. Thank you for inspiring us! Oh my gosh this panini looks sinful. I'm interested to try this now,basil is herby idea! This sandwich has caught my eye many times too. You've made it look so delicious. I'd love to give it a try! I have to say, I never would have made this. I could put brie and basil together, or brie and chocolate, but I never would have put basil and chocolate together. Hmmmm... I am glad it worked out for you though! That's the reward you get for taking chances. 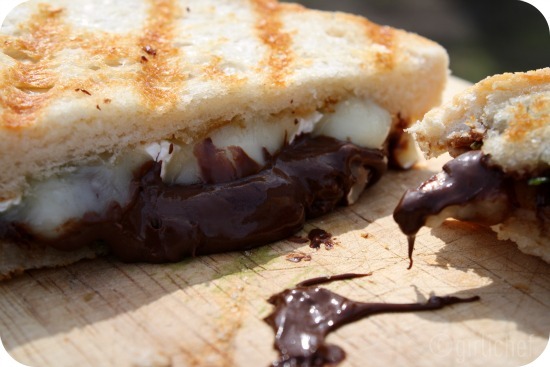 The chocolate oozing out from panini makes me hungry. Awesome delicious. What a fascinating combination, bet it was delicious! What a great idea! I think I want to try nutella with this recipe.